Congolese Have Done Their Part. Now's SADC and the AU's Moment of Truth. 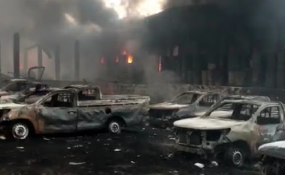 Vehicles in a warehouse of the Independent National Electoral Commission in Kinshasa were destroyed by a fire on December 13, 2018. The United States was deeply concerned by the DRC’s National Independent Electoral Commission (CENI) decision to deny accreditation to several international election observers and media representatives. We also noted that confusion on election day over the location of polling stations, the posting of voter lists, the late delivery of some election materials, and CENI's unfortunate decision to cancel elections in Beni and Butembo in eastern DRC disenfranchised voters. Nevertheless, despite these challenges, millions of Congolese citizens turned out peacefully across DRC on election day to cast their ballots and make their voices heard. ‎CENI must now ensure that these voices and votes are respected. As the Congolese people, the region, and the world await patiently for the results of these elections, the internet must be restored and the media allowed to report freely. We strongly urge the CENI to ensure that votes are counted in a transparent and open manner, with observers present, and that the results reported by CENI are accurate and correspond to results announced at each of DRC's 75,000 polling stations. We support the African Union Election Observation Mission to DRC’s expectation, expressed on January 2, that the announced results align with votes cast by the Congolese people. As official results are tabulated and reported, we continue to urge DRC government officials, leaders of the DRC security forces, opposition party leaders, civil society representatives, and stakeholders from all sides to respect the law and reject violence. There are moments in every nation’s history when individuals and political leaders step forward and do the right thing. This is one of those moments for the DRC. Those who enable a peaceful, democratic transfer of power out of respect for DRC’s constitution and the results of this election will be hailed, while those responsible for undermining democratic institutions and processes, threatening the peace, security, or stability of DRC or benefiting from corruption ‎will be held accountable. Those who undermine the democratic process, threaten the peace, security or stability of the DRC, or benefit from corruption may find themselves not welcome in the United States and cut off from the U.S. financial system.